AV-300AHD-Mini-L a complete set of video transmission standard AHD-L / AHD-M, and Audio / Video PAL (CVBS). The system operates on the 5.8GHz frequency generates by PLPL solution. It provides of sending noise-free, high-quality video signal. Presented sender is designed for use witch CCTV AHD cameras which are installed in the elevators. This solution reduces the high cost of installation, and allows you to install CCTV cameras in places where extension of CCTV system is dificult. Built-in directional antennas provide radio transmission of high-resolution 1.3 Mpix distance up to 300 meters without the need to connect external antennas. 8 radio channels with high resistance to crosstalk, allows the use of multiple devices in the same elevator shaft, which may be necessary in large buildings with multiple elevators. Installation of the kit are very simple and do not require special knowledge and tools. After having examined the possibilities of radio transmission, simply screwing the transmitter and receiver to the location, wiring and setting the choose transmission channel. Built-in connections BNC test, are designed to quickly locate seource of potential malfunction. Usually AHD cameras have the ability to change between standard PAL and AHD. Transmitter automatically detects type of input signal (AHD / Analog) and automatically switches output signal of the receiver to the same standard. This solution facilitates commissioning installation and maintenance system using the standard service monitors. Before installation, ensure the ability to transmit radio signals in the 5.8GHz band and properly install the kit components to the movement of the elevator does not cause large changes in the radio wave propagation. To connect Video signal can be used coaxial cable or twisted pair (UTP) because trasmitter and receiver have build in HD video balun. 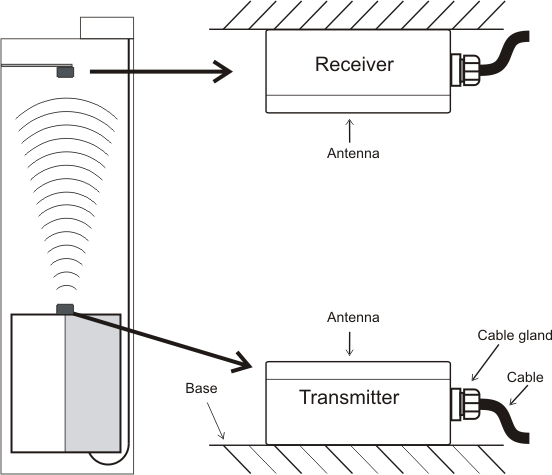 This allows to use any method for wiring on of the transmitter and receiver side. Internal video balun are compatible external video baluns, model TR-1F-HD or other compatible devices designed by Ewimar company, such as a series of LHD or HDT-1F. You can apply the same wiring on the transmitter and receiver side or freely mixed. The transmitter and receiver are equipped with additional test BNC connector, which you can connect cameras or monitors, to help you diagnose any faults or assist in the configuration.